WUR researchers want to use artificial intelligence to measure the resilience of pigs and be able to give early warning of a raised risk of illness or tail biting. Healthy, happy animals don’t bite each other. By linking camera footage with other signals from the shed, the researchers hope to be able to forestall approaching diseases and problems. 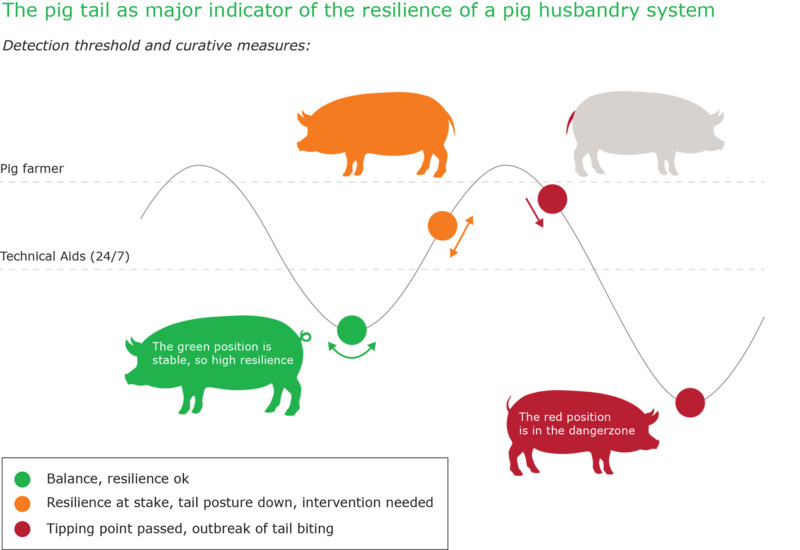 A reduction in resilience can lead to pigs becoming sick or frustrated. When they are run down, they are more likely to fall prey to diseases or to start biting each other’s tails. This leads to an increased use of antibiotics and affects the pigs’ welfare. Besides the pressure being applied to cut back further on antibiotic use in the livestock sector, European legislation is expected in a few years that will ban pig farmers from docking pigs’ tails. As a consequence, there are growing fears that tail biting among pigs will increase. But how much damage does that do? Two and a half years ago, Marion Kluivers, who works at Wageningen Livestock Research, monitored a big group of pigs at WUR’s experimental pig farm in Sterksel. Over the period of the test, 10 percent of the pigs suffered tail damage, in spite of intensive supervision and monitoring. An automated monitoring systems is being developed so as to pick up early signs of disease and of tail biting. The pigs are monitored 24 hours a day. So Kluivers wants to find out how healthy and resilient pigs are by monitoring their behaviour, so as to be able to give early warning of the risk of disease and tail biting. Because if you recognize the signs, you can make adjustments and forestall approaching problems. She wants to do this using an automatic monitoring system developed to keep an eye on the pigs 24/7. She is working on this with WUR experts in the fields of animal behaviour, computer vision and deep learning, who record the behaviour and use a smart system to convert it into useful information for the pig farmer. 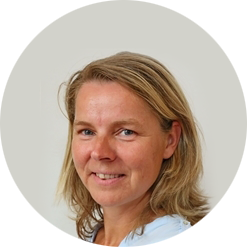 Marion Kluivers works on this interdisciplinary research with WUR scientists in the fields of sustainable livestock, sustainable agriculture and horticulture, and farm technology. Because the idea is that the signals lead to a fully automated early warning system that supports the pig farmer in animal management. Kluivers expects this resilience research to benefit the health and welfare of pigs and the pig farm’s performance, and to reduce antibiotics use. If a disease-prone animal is spotted early, and if tail biting is knocked on the head in good time, the need for antibiotics on the farm goes down. The innovative element in this research is its use of artificial intelligence. “We were already doing behaviour research using direct observation, and studying video footage from the shed. Now we want to process images automatically and link them with other information from the shed.